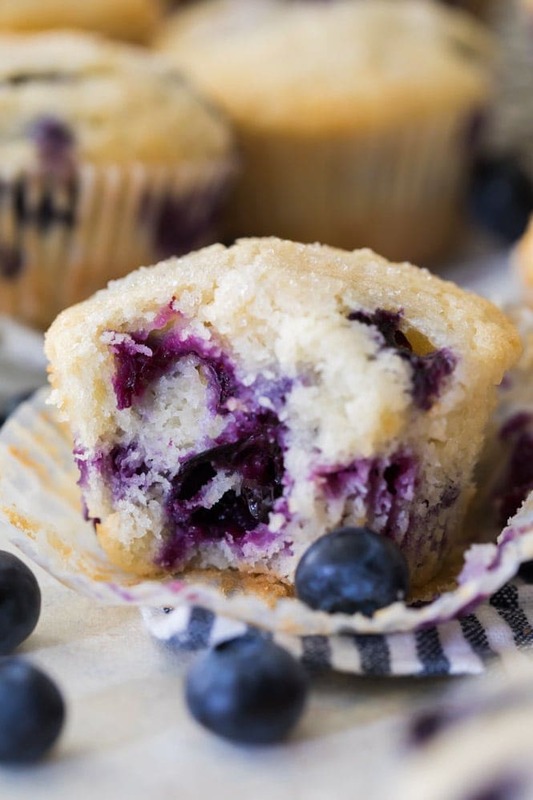 Soft and fluffy muffins with hints of vanilla packed full of sweet plump blueberries and slightly sugared tops, these are the BEST blueberry muffins, and they’re made completely from scratch! Today’s post is packed full of tips for getting the fluffiest muffins with bakery-style tops, and even includes a video of how I make these muffins in my own kitchen (see video at the bottom of the post just below the recipe). “I need a recipe for a good blueberry muffin”. Can I start by saying how much I love it when I get recipe requests? The request has come to me through e-mail, through the comments section, from social media, and from the mouths of family members, and today I am happy to oblige (plus it’s a great way to continue my blueberry recipe streak… have you tried my blueberry cobbler yet?!). Over a year and a half ago I developed the perfect (in my opinion, anyway, though many of you have agreed in the comments!) muffin recipe base and I shared that on the blog in the form of my chocolate chip muffins. Since then, that recipe has received rave reviews and I’ve adapted the recipe for my banana muffins, which are probably the most popular on my whole blog. 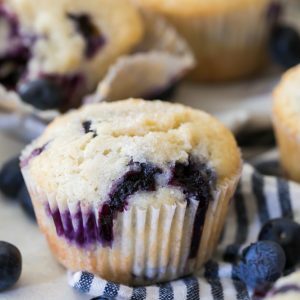 So, if today’s blueberry muffin recipe sounds a little familiar to you, that’s because the basic foundation of it, as well as much of the technique, comes from my previous muffin recipes. 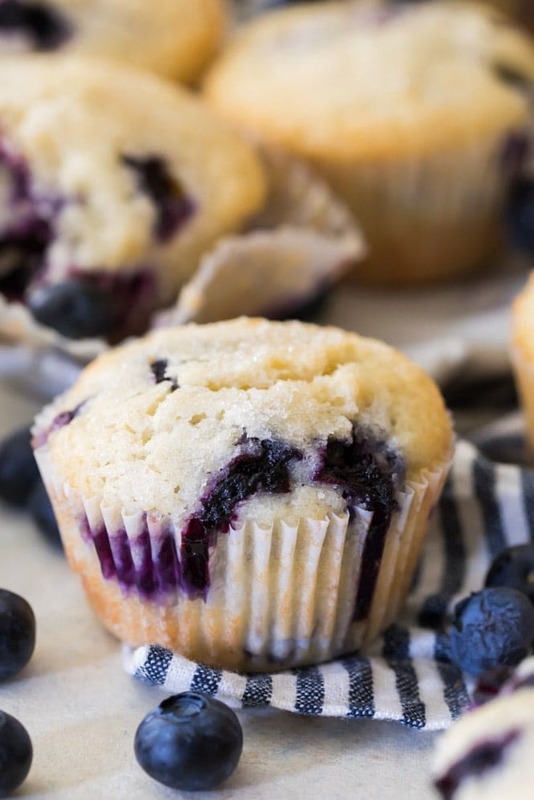 It’s a solid, tested, and proven (over and over again) recipe, so I think you’ll love it just as much with today’s blueberry muffins. If you haven’t tried those recipes before, I’ll cover the most important tips and tricks below. Plus, I’ve included a video just below the recipe showing exactly how I make these in my own kitchen. As with my other muffin recipes, I start by baking my blueberry muffins on a high temperature (425F) and then drop the temperature (to 350F) halfway through baking. It is very important that you do not open the oven door when you drop the temperature, as opening the door allows a lot of heat to escape (hopefully you’re better than I am about remembering this part!). Starting your muffin batter off on a higher temperature allows the muffin batter to begin to rise and then dropping the temperature allows the interiors of your muffins to finish cooking without drying out, keeping the centers nice, soft, and fluffy. Can I use Frozen Blueberries to Make Blueberry Muffins? Yes! This recipe works well with 1 1/2 cups of either fresh or frozen blueberries! If you do use frozen berries you should add them to the batter while they are still frozen — no need to thaw. One word of caution: I’ve found that using “wild” frozen blueberries can cause bright purple streaks in your muffin batter! If your batter ends up vibrantly streaked, your muffins will still taste just as good, the color will just be a little different! Anyway, how is your Monday going so far? Please see below the recipe for a video on how I make these Blueberry Muffins at home! If you enjoy watching these videos, please consider subscribing to my YouTube channel! Soft and fluffy, studded with sweet plump blueberries and slightly sugared tops, these are my favorite blueberry muffins. Combine the melted butter and canola oil in a large bowl. Stir well. Using a spatula, gently fold the dry ingredients into the wet, taking care not to over-mix. 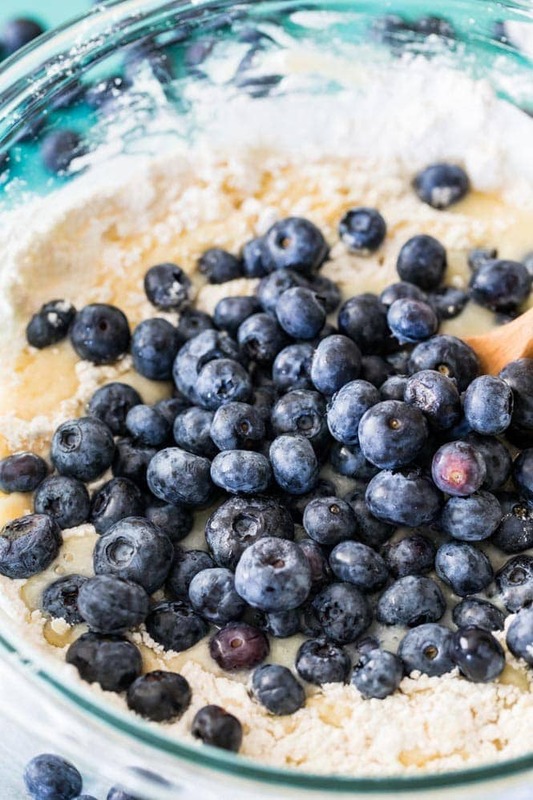 Once about half of the dry ingredients have been combined, add in blueberries and continue to fold in to batter until just combined. Bake on 425F (215C) for 8 minutes and then, without opening the oven door, reduce the oven temperature to 350 (175C) and bake another 12 minutes, or until tops are just beginning to turn golden brown. *If you don't happen to have buttermilk, you can use this buttermilk substitute. Blueberry muffins were amazing.I thought they needed a little more sugar or could be just me.Still couldn’t ask for a better recipe! Also made your chocolate chip banana bread and loved it!Thank You. i was wondering. After mixing, if I put the batter in the muffin pan and then let set for 15 min will the outcome be the same as mixing, let set in bowl and then placing in the muffin pans. Thank you for the tip! I will keep this handy when out of unsalted butter. Your quick response is awesome! Just made this for the hubby and he loves it!! These muffins are so goooood!!!! Another WINNER! Loved the flavor, texture, and the rise on the babies! Just made these muffins with wild blueberries. So delicious! Yum! Yum!! My 14 month old LOVES these! And so does her Mommy! Great recipe! Quick question- do these need to be refrigerated? Wasn’t sure, since they have egg and egg whites. Thanks! We love your site!! Made mine today as well….wow, a very very good recipe, I used fresh North Carolina Blueberries! Outstanding recipe. 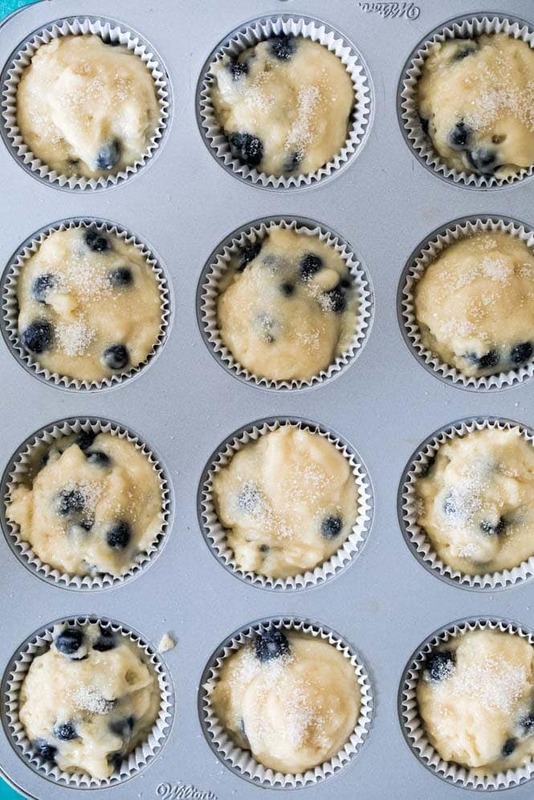 Do you put the blueberries in frozen or thaw them before adding to the batter? Hi, what could I use in place of the corn starch? First off I have a new job and am surrounded by ladies. I have made 2 of your recipes so far and have risen to the top of popularity thanks to you. For this recipe what would I do different if I wanted to make mini muffins or mini blueberry muffin loaves? I haven’t made them as mini loaves so I’m not sure how they would turn out, but you could definitely use a mini muffin tin to make them mini, they will just need less time to bake — I’d start checking around 14 minutes or so. Enjoy! I substituted blackberries for the blueberries. YUM! Came out GREAT! Even my mom was impressed with the texture. Add your website to the recipe so I know where to go to find more after I have printed and filed it. So glad you enjoyed! And YES, wow I need to do that, thank you!